The PVC used in BCW Toploads contain no plasticizers or stearates. BCW's high impact grade PVC does not migrate and will not harm your cards, photos or currency, while offering maximum protection and visual appeal. Sold in packs of 25. Holds 5.875 x 3.75 Postcards. Crystal clear Made of high impact rigid PVC . Exterior Dimensions 6 1/8 x 3 7/8 x 1/16 Interior Dimensions 5 13/16 x 3 3/4 x 1/32. 2 mil sleeve. Ultra Crystal clear polypropylene. This way, we assure that we have settled any and all problems that may occur. Local pickup is not available. Acid Free and Archival Safe. Manufactured by Ultra Pro. We Carry Everything! Crystal Clear Polypropylene. All your storage and protection supplies in one place. Trending at $5.79eBay determines this price through a machine learned model of the product's sale prices within the last 90 days. <> Archival Safe. <> Acid Free - No PVC. <> Clear Polypropylene. Card Sleeves 3 11/16 x 5 3/4. Clear Polypropylene. Crystal Clear & Archival Safe. Single Cards - Baseball Single Cards - Basketball Single Cards - Football Single Cards - Hockey Single Cards - Non-Sports Single Cards - Soccer Single Cards - UFC / Wrestling. This does not apply if you are purchasing our custom glass display cases (see below) . This product features high-clarity polypropylene and top loading pockets with strong welds. BCW Pro 2-Pocket pages fit all standard3-ring binders and albums. 1 Lot = 10 count New 2 Pocket Pages. Pro 2-Pocket Page. Manufactured by BCW. 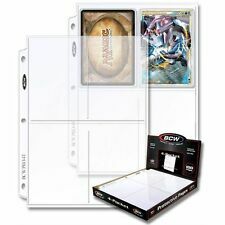 BCW Card Sleeves are an acid free, archival quality product made of crystal clear polypropylene. Acid Free and Archival Safe. We Carry Everything! All your storage and protection supplies in one place. Ultra Pro 5" x 7" Size Soft Sleeves. Manufactured by Ultra Pro. Archival-grade, acid-free and non-PVC premium card sleeves designed to hold standard 5" X 7" cards. Ideal for use with photos, large cards and with matching size toploaders. Postcard sleeves 4 3/8 X 6 1/4. 25 Count . Condition is New. Shipped with USPS First Class Package. 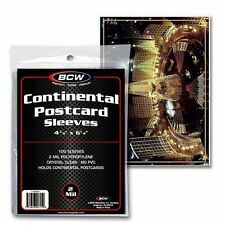 BCW Continental Postcard Sleeves for 4x6 postcards. 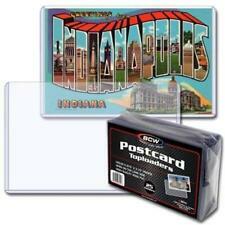 You will receive 25 new postcard sleeves to help protect your postcards or photos. 25 for $1.50 and $1.00 shipping and handling. 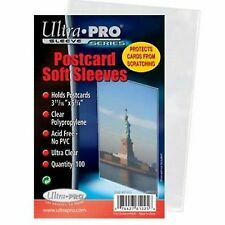 1000 PRO SAFE Premium Postcard Sleeves 3 11/16" x 5 3/4" Wholesale Lot-Free S&H! Card Sleeves Size: 3 11/16 x 5 3/4". Archival Safe. <> Acid Free - No PVC. <> Clear Polypropylene. This is it! The NEXT GENERATION top loaders for the ultimate in card protection. Single Cards - Baseball Single Cards - Basketball Single Cards - Football Single Cards - Hockey Single Cards - Non-Sports Single Cards - Soccer Single Cards - UFC / Wrestling. Manufactured by BCW. The PVC used in BCW Toploads contain no plasticizers or stearates. Archival Safe. Made of High Impact Rigid PVC. All your storage and protection supplies in one place. Trending at $19.80eBay determines this price through a machine learned model of the product's sale prices within the last 90 days. SAFTGARD 3.5 X 5.5 - Topload Holder. - Made of high impact rigid PVC. - Exterior 3 15/16 x 5 11/16 x 1/16. - Opening on short side. Made of archival safe, soft, clear polypropylene. We won't do it. US territories also o.k. The PVC used in BCW Toploads contains no plasticizers or stearates. - Made of high impact rigid PVC. These are similar to the 4x6 toploads, except they load from the 6" side instead of the 4" side. - Crystal clear. (Anyway, just keep that in mind, :). New, right out of the bag, Never Used ! BCW Card Sleeves are an acid-free, archival quality product made of crystal clear polypropylene. Made of archival safe, soft, clear polypropylene. Manufactured by BCW. 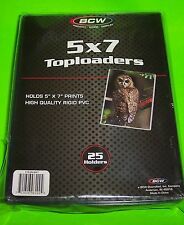 BCW Card Sleeves are an acid free, archival quality product made of crystal clear polypropylene. All your storage and protection supplies in one place. for any reason. Your First Stop For Hobby Supplies, Trading Cards and Sealed Boxes. Acid Free and Archival Safe. Ultra Pro 4" x 6" Size Soft Sleeves. Manufactured by Ultra Pro. Archival-grade, acid-free and non-PVC premium card sleeves designed to hold standard 4" X 6" cards. Ideal for use with photos, large cards and with matching size toploaders. This product features high clarity and strong welds. TheBCW Pro 2-Pocket pages f it all standard 3-ring binders and albums. - Pocket 7-1/8" x 5-7/16". - Page 7-15/16" x 11-3/8". They are constructed of white corrugated paper and have a 200 lb. test strength. Brilliant white. 2 piece box (Lid included). Local pickup is not available. Holds two 5"x7" photographs or cards. 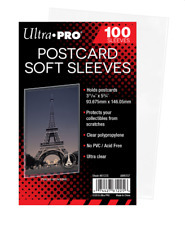 1000 1,000 ProSafe Premium Postcard Sleeves Wholesale Lot - FREE Shipping! Card Sleeves Size: 3 11/16 x 5 3/4". Holds two 5"x7" photographs or cards. SKU: 1-PRO2T-20 Weight: 0.64 lbs. Circa 1910 - 20's. Empty, no cards. Album cover made from beige leatherette with floral design. NO RESERVE! No handling fee will be assessed on this item. This Lot sold "As Described". It is not an indication of low value or poor quality condition. This is the actual item for sale! The PVC used in CBG Toploads contain no plasticizers or stearates. - Made of high impact rigid PVC. Single Cards - Baseball Single Cards - Basketball Single Cards - Football Single Cards - Hockey Single Cards - Non-Sports Single Cards - Soccer Single Cards - UFC / Wrestling. This is it! The NEXT GENERATION top loaders for the ultimate in card protection. Our fees, service and organization is top quality. Single Cards - Baseball Single Cards - Basketball Single Cards - Football Single Cards - Hockey Single Cards - Non-Sports Single Cards - Soccer Single Cards - UFC / Wrestling. Ideal for use with photos. Ultra Pro 11" x 17" Soft Sleeves. Manufactured by Ultra Pro. We Carry Everything! Need Supplies?. Open on the long side. They have holes in the bases for wall mounting or securing them to a shelf or table. The stands vary slightly in appearance due to their age.